The mild Gulf Stream that bathes the Connemara coast brings an abundance of colourful marine life. Seeing the dramatic seascapes of coves and islands from below the surface is an experience you’ll never forget. 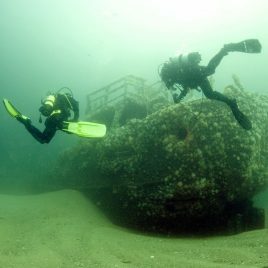 Scubadive West, on Killary Harbour, provides sheltered shore diving, access to offshore dive sites, dive safaris, supervised dives, and a range of PADI courses for beginners and the more experienced. The centre is open year round. We have scheduled boat dives departing to world class dive sites and shore diving onsite in our private sheltered cove. Our extensive rental room includes top of the range neoprene drysuits and thermals, semi-drys, weight integrated BCD’s and regulators fitted with dive computers. We are agents for Scubapro, SUUNTO, O’Three, Fourth Element, Analox, Oceanic and many more. We are also an IDEST approved testing house.